If you live in the Bay area long enough, you'll experience a large earthquake. When that happens, of course the first priority is to save yourself and check on your neighbors. But new imaging techniques give you ways of using your phone to help scientists learn from the event. 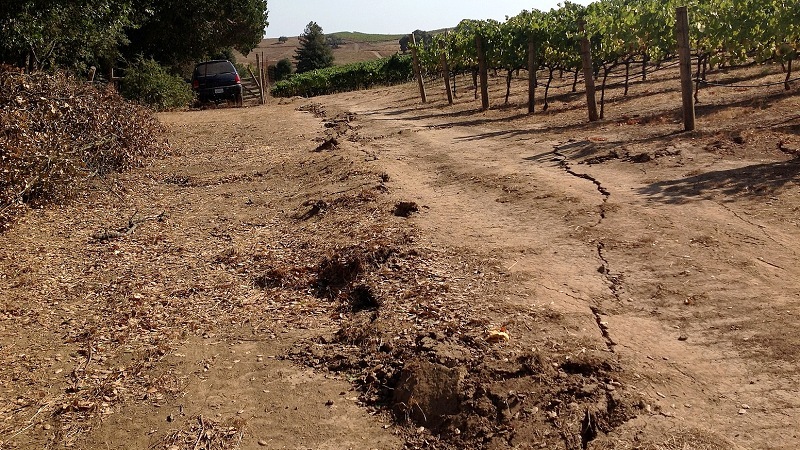 The South Napa earthquake of August 24, 2014 was documented by thousands of people around the epicenter, each in their own ways. Images from that day show that most people, naturally, turned their cameras toward broken buildings, fires, injuries and ambulances. But when earthquake scientists entered the epicentral area, their eyes were on the ground. Time is crucial in quake investigations, and much can happen during the hours and days before scientists get around to every interesting spot. Residents have the advantage of being there already. Geologists pour into town after a large earthquake. Some are there to assess damages and help plan repairs. Others will be researchers from state and federal agencies. Earth science teachers will bring their classes to the scene, first to help out and second to give students a taste of meaningful fieldwork. Mike Oskin, a UC Davis researcher, was one of those who raced in with his students to study the quake zone after the Napa quake. He says that phone cameras recorded scientifically useful data. 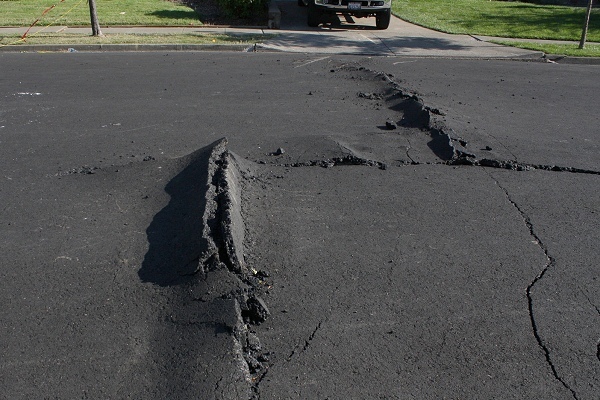 Ground offsets: Fresh cracks with evidence of motionup, down or sidewaysare valuable clues. Take these photos early and often, Oskin says: "The phenomenon of afterslip, where slow deformation continues after the earthquake, means that getting an observation as soon as possible is desirable, along with additional observations later." Upheaval and subsidence: Sloping ground, or land near a riverbank, may sink as the ground compacts or moves sideways. Other areas may rise from compressive forces, like the "moletrack" shown at the top of this post. Again, repeated photos can document a history of progressive motion. Landslides: These can happen from minutes to months after an earthquake, depending on the degree of shaking, recent rainfall and aftershocks. A series of images taken from the same spot can document imperceptible shifts in the land before a slide. Sand boils and similar disturbances: Eruptions of mud and sand are common after many earthquakes. Recording short videos of these as well as still images may be useful. Streamflow: A well-known aftereffect of earthquakes is a short-lived surge in water flowing through streams. If you live near a stream, even one that's dry most of the year, check it often and record any changes in its behavior. Short videos may help in gauging the volume of flow. Once you've gathered photographic data, it's important to find a scientist to share it with, the sooner the better. Oskin says, "Early on scientists don't know where to find the surface rupture, so citizen-scientists can contribute a lot to figuring out what happened. As far as I'm concerned, broadcasting information via social media (Twitter) is perfect for sharing information about surface rupture." Scientists themselves were well served after the Napa quake by the California Earthquake Clearinghouse, a temporary field center where all sorts of responders could coordinate and share information. So if you give a scientist a tip to something interesting, they will know where to pass it on. The most promising advance in this field is that scientists can stitch sets of photoseven your phone-cam shotsinto three-dimensional models. This technique is called "structure from motion," or SfM. Tim Dawson of the California Geological Survey, who coordinated the state's data collection campaign after the Napa quake, says of SfM that "if people were more aware of it, it would be useful for quick data collection." SfM was introduced to Earth scientists just a few years ago. It's like the familiar process of making stereoscopic images, but on steroids. 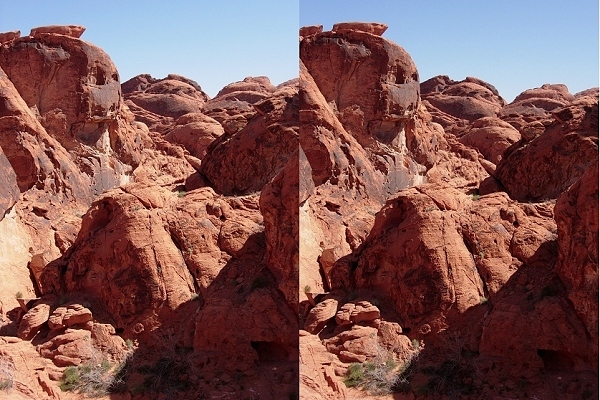 In stereoscopy, the brain matches corresponding features in the two images and automatically translates them into a 3D picture. In SfM, a computer matches small details between multiple images and uses them as a framework to assemble the data into a 3D model. To make a set of photos for SfM, walk around the feature and take at least a dozen shots. Ensure lots of overlap, be sure to add a scale object, and don't change the zoom or the camera orientation. The geolocation and EXIF data that most smartphones and cameras attach to photos is very helpful for scientific purposes. Oskin says that his students are refining the technique: "One of our goals is in fact to make this accessible for the public." Anyone with the presence of mind to look around in the wake of a major quake can contribute to earthquake science. In your hands, a smartphone can become a scientific tool. If this appeals to you, put a portable charger on your emergency preparedness shopping list.